Are the Weight of Your Responsibilities Getting to You? Sometimes the burden and responsibilities of being a leader weigh heavy on me. Knowing how many people are dependent on the organization that we run, trying to make wise decisions, dealing with sticky problems — it can all get a little much. A few nights ago I woke at 2:30 a.m. tossing and turning with some of the worries. Try as I might, I could not fall back asleep, so I gave in and got up to pray. The page I opened to in my dad’s highlighted bible. I opened my bible to read. This was one of my dad’s bibles that is well-used, marked up and highlighted. I opened it at random and my eyes fell upon a neon-blue circled phrase: “Stop worrying.” I laughed out loud. How much more direct could that be? It was Jesus saying it in the passage but I could also hear the voice of my dad in it. 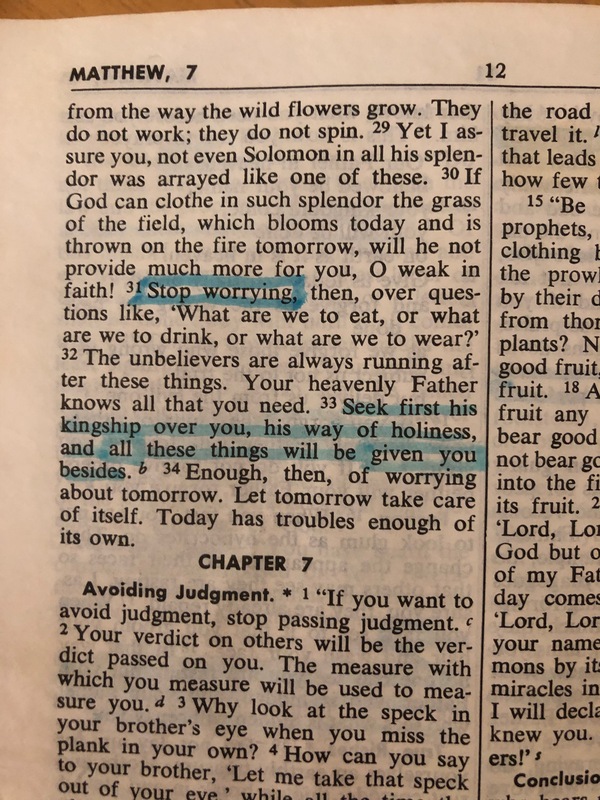 My dad would often tell people that he thought “thou shalt not worry” should be the 11th commandment since it comes up so much in Scripture. The passage I had opened onto was in Matthew 6, and I went on to read: “Your Heavenly Father knows all that you need. Seek first his kingship over you, his way of holiness, and all these things will be given you besides. Enough, then, of worrying…” Matthew 6:31-34. “Enough, then, of worrying, Ellen,” was the message that came loud and clear. So what was I to do instead? “Seek first his kingship over you, his way of holiness…” What does that mean? I remember hearing Elisabeth Elliot speak once. She was married to Jim Elliot who was killed, along with several other missionaries, as they tried to bring the gospel to the native Indians of Ecuador. As the shock and grief threatened to overwhelm the young widows, an older woman counseled them, “Just do the next thing.” Elisabeth had her very young daughter with her in the jungles of the mission camp, and there were things that needed to be done to keep on living. By focusing on “doing the next thing” — “the duty of the moment” as Catherine Doherty called it — it brought her some measure of relief and solace. So in seeking God’s will each day, it usually comes packaged as mundane, ordinary tasks: feed the dog, put away the dishes, make breakfast, get dressed, make your bed, etc. Check in regularly with the Lord, especially when there is a choice of things you could do (should I call this person or go to the bank? ), and peacefully follow that leading, making the intention in your heart that you want to do God’s will. Then leave the worrying to him. *Curtis Mitch and Edward Sri, The Gospel of Matthew, Catholic Commentary on Sacred Scripture series (Grand Rapids, MI: Baker Academic, 2010), 112.